The Alumni Association Church history tours reenergized participants and built camaraderie among groups. Darlene Seachrist entered the Sacred Grove in July with members of a BYU Alumni Association tour visiting Church sites in Ohio and New York. The Pennsylvania bus driver swatted her arm several times, and when she left the grove, she said that what she had thought was a bug or a leaf landing on her arm was really her hairs standing on end. “Wow, there’s a lot of energy in the grove,” she said. If the evaluations of the tour participants are any indication, there was a generous amount of energy and spirit everywhere. Some participants studied the gospel on site at Kirtland, Palmyra, and Cumorah, while others visited sites in and around Nauvoo and Independence. Roughly 800 alumni and friends responded to an invitation to travel with the Alumni Association in July and August on tours that would highlight, among other stops, the Hill Cumorah Pageant, the City of Joseph Pageant, and the Nauvoo and Palmyra temples. The 14 tour buses accommodated families, reunions, couples, and, in one case, a group from the Sons of Utah Pioneers. 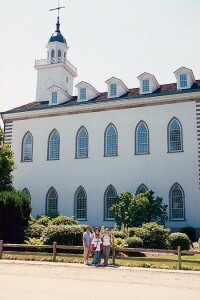 Participants in a BYU Alumni Association Church history tour visit the Kirtland Temple. Besides Kirtland, tour buses took groups to Palmyra, Nauvoo, and Independence. Photo by BYU Alumni Association. The Alumni Association has an active touring program that also includes a fall foliage Church history tour, sports tours, and cruises. For more information, visitalumni.byu.edu/newsandevents/tours. You can also contact Reid Robison at 1-877-827-2216 or reid_robison@byu.edu.